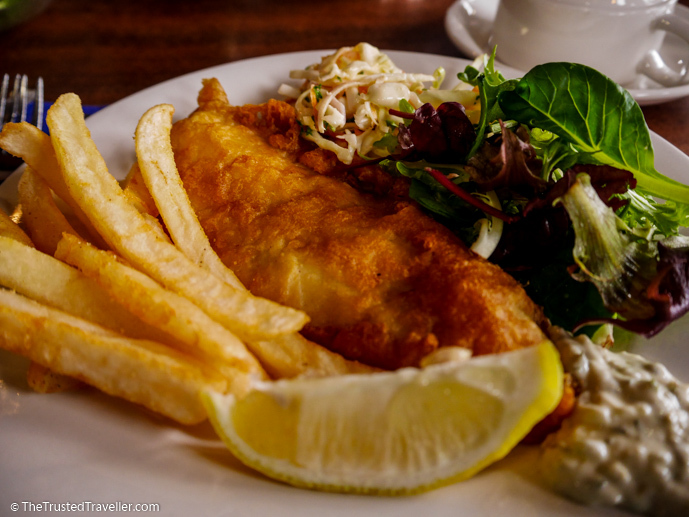 When we started planning our great Australian road trip, we made a list of some of the things we absolutely had to see and do as we travelled around. Quite near the top of that list was taking a Murray River cruise. Recently, we got the chance to do just that, thanks to Captain Cook Cruises and their luxurious paddlewheeler, the PS Murray Princess. Our four night cruise was incredibly relaxing and enjoyable. And we can’t wait to tell you about it, so let’s get started! 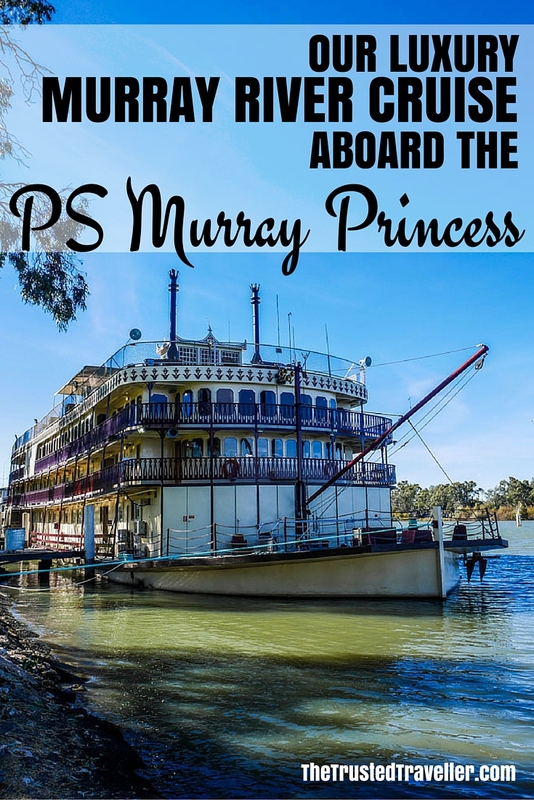 30 years old this year, the PS Murray Princess is the largest inland paddlewheeler in the southern hemisphere and is propelled through the river by a massive wheel at the stern (back) of the vessel. 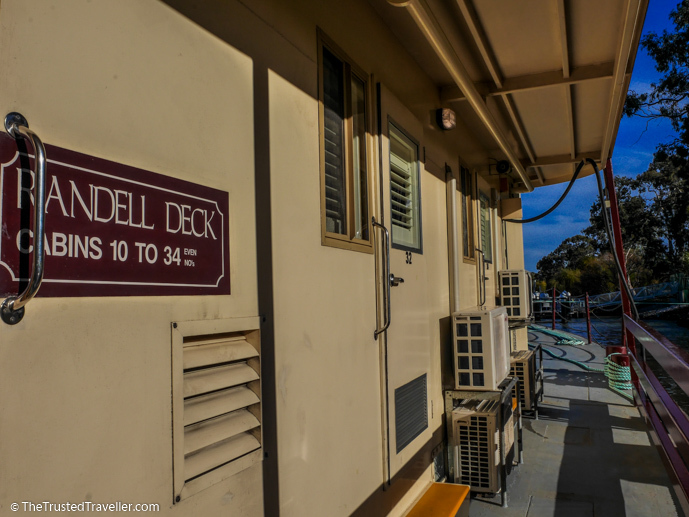 Four of its five decks are named after some of the Murray Rivers greatest pioneers; Charles Sturt; William Randell; Francis Cadell; and the Chaffey brothers, George and William. The vessels interior is tastefully decorated with mahogany style furnishings and decoration. On-board is a two-story lounge at the back of the vessel which offers the best view of the paddlewheel; a spacious dining room with dance floor and buffet; adjacent bar which offers views out the front of the vessel from both inside and the outside balcony; a sundeck on the roof; and below deck facilities like gym, spa, sauna and laundry. Cruises can fit up to 120 people in the 60 rooms on-board. However, the crew told us most cruises have less than 100 people on-board making it a more intimate experience which allows guests more of a chance to get to meet their fellow passengers. While visiting the wheelhouse, we were told by Captain Keith Halloran, our cruises Captain, that the vessel moves at an average speed of just 10 km per hour. It a very smooth, calm and relaxing ride. For a relatively small vessel, Captain Cook Cruises have made good use of the little space they have to create practical and comfortable accommodation for guests. Now, we’re not going to go ahead and tell you the rooms are spacious, but they are arranged to be functional and serve their purpose, a place to sleep, store your belongings and freshen up. On-board, there are many other areas perfect for relaxing and socialising, so you’ll spend very little time in your room itself. There are three different room types on-board, staterooms; outside cabins; and inside cabins, each with its own small private bathroom that includes toilet, shower and basin and a wardrobe for your clothes. We got to take a peek inside each of the room types. 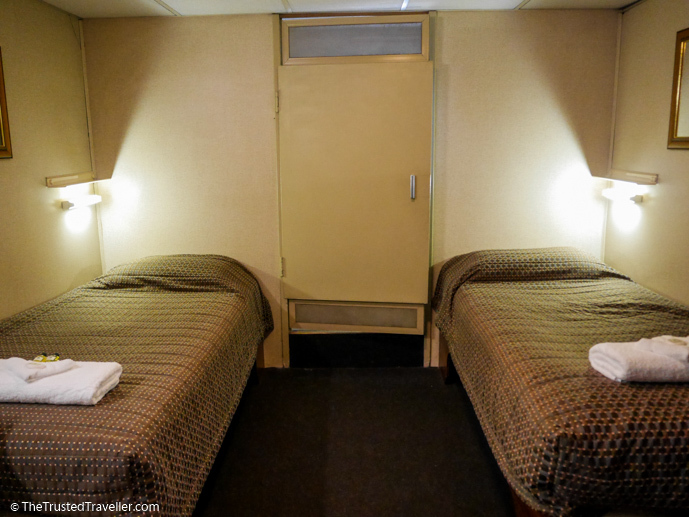 Inside cabins are located below deck and have a small porthole to let in some natural light. They come in either twin or double. Outside cabins are much the same in size as the inside cabins, with the difference being their location on the upper decks and that they also come in triple configuration. A door opens directly onto the outside deck and the cabin has picture windows letting in plenty of light. Staterooms, of which there are only six on-board, are the most spacious. They are similar to the outside cabins with the addition of a fridge and tea/coffee-making facilities and come in either a double only or double and single configuration. 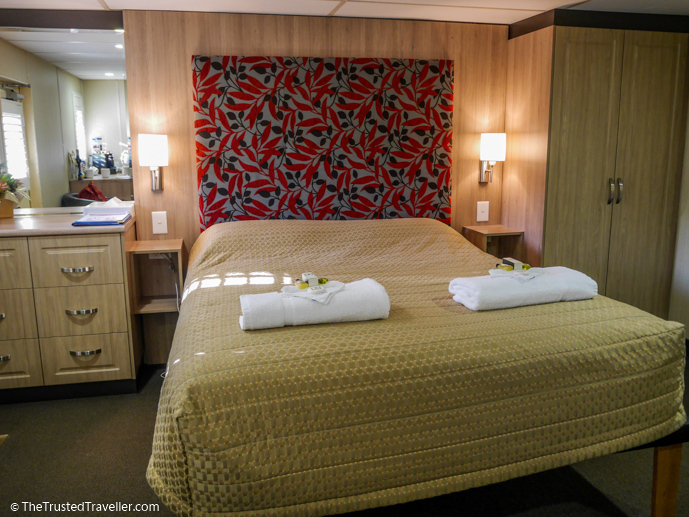 We were fortunate enough to spend our four nights in a stateroom which we found quite comfortable. There was plenty of room to store our belongings, the bed was reasonably comfortable with plenty of blankets and pillows and everything was exceptionally clean on arrival, and after each mornings service. All in all, accommodation on-board the Murray Princess is comfortable and on-par size-wise with larger cruise ships we’ve been on in the past. 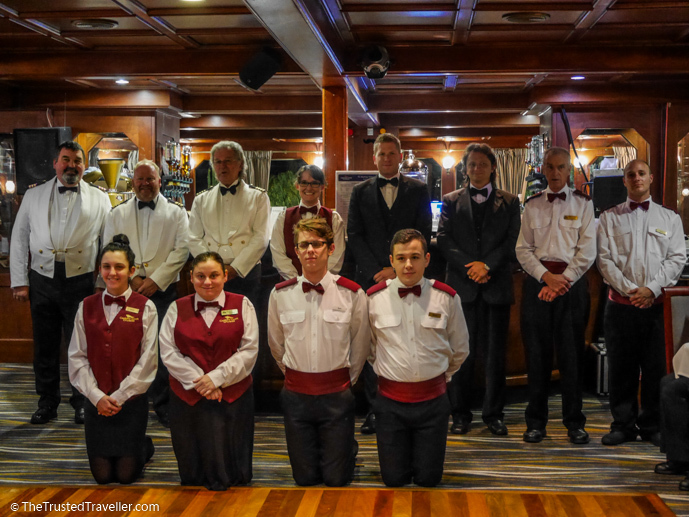 One of the highlights of our cruise was the staff. Every single staff member we met during our cruise was incredibly helpful and friendly. Straight away you can tell that each of them love their jobs and know what good customer service is. There are a multitude of staff on-board that each play their part in ensuring the smooth running of the cruise as well as making the guests feel welcome and comfortable. And because we were cruising during the quieter part of the year, with only 45 passengers on-board, the staff were taking the chance to do some training, so we had an extra few people around helping out. Stand outs for us were our Cruise Director Kevin and his trainee Kelly. They were both a constant source of information about our cruise and kept everything running smoothly, even when we had a minor mechanical hiccup. They also took the time to get to know us and the other passengers on-board. The other standout was our Bar Manager Gary. Gary has worked on the Murray Princess for 16 years so he knows a thing or two about the vessel and the Murray River. He’s got many stories to tell about past cruises and he does an excellent job of remembering your name and what you drink! While all staff are immaculately presented and professional, they are relaxed enough to make the atmosphere feel unpretentious, which made us and our fellow passengers relaxed also. The only thing better than the staff was of course the food. And boy was there plenty of it! 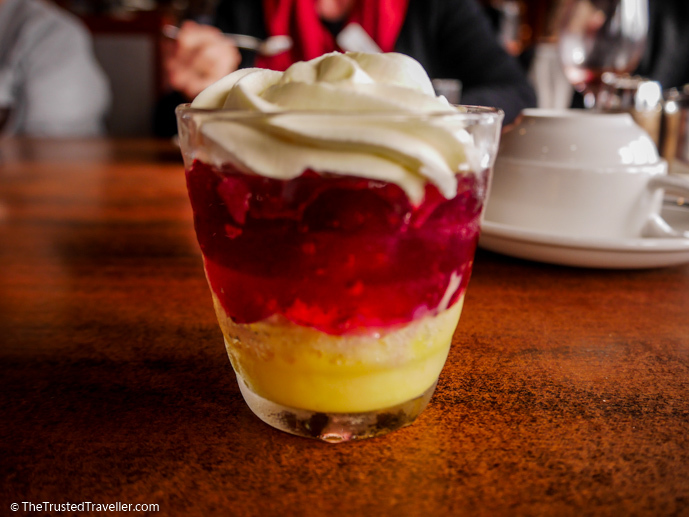 Breakfast, lunch and dinner are included each day during the cruise, as well as tea, coffee and biscuits which are available in the lounge 24 hours a day and a basket of fruit in the dinner room. Meals change each day with lots of variety in both the ingredients and style of meal. One day its a three course meal, the next a BBQ or a buffet. There are lots to choose from and they also do their best to cater for people with dietary requirements too. Breakfast each day was a buffet that included hot and cold items like eggs, bacon, sausage, tomato, mushroom, beans, cereals, fruit, yogurt, toast and a daily special. Everything we ate was delicious especially the special muffin on the last day! Lunch was different each day and served in the dining room. 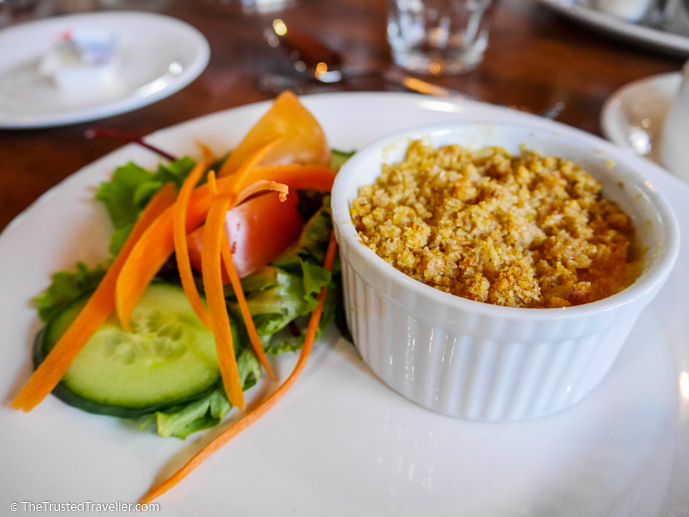 Our first lunch was a delicious two course meal with a choice between a steak burger or a smoked trout and salmon mornay both served with salad. 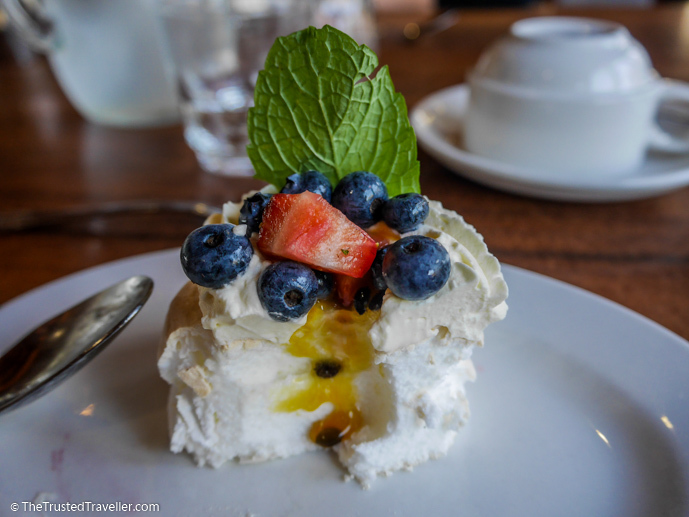 And for dessert a pavlova which was the best thing we ate on the whole cruise. The following day was a lunch buffet which included a lamb curry, roast chicken pieces and salad with fruit for dessert. And for our last lunch we had a choice between chicken and chips and fish and chips, both served with salad and a trifle for dessert. 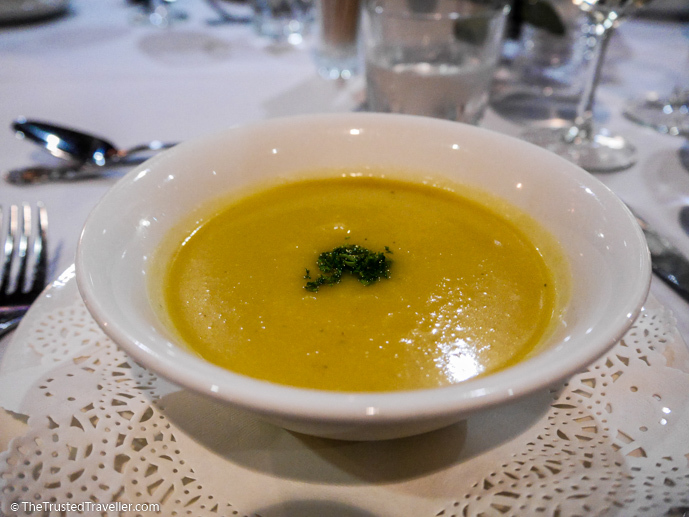 Dinner was just as varied as lunch starting with a five-star three course meal on the first night. 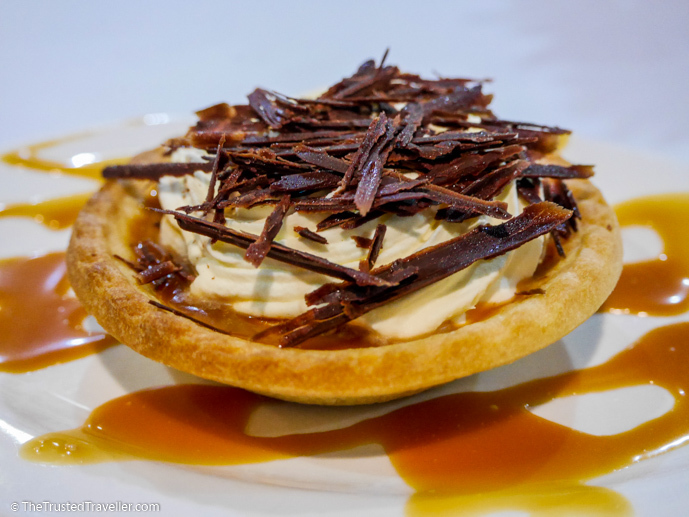 Entrée was a parsnip and cauliflower soup, then a choice of mains, either pork or duck served with sweet potato mash and greens and a delicious banoffee tart to finish. 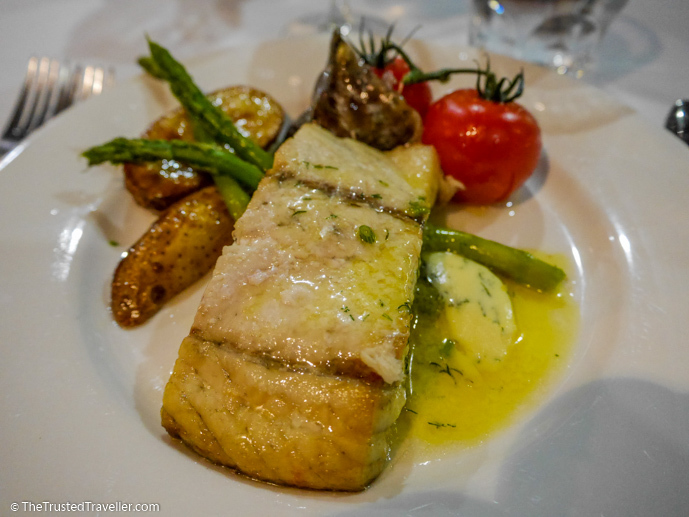 On day two we were served hot and cold canapes in the bar before enjoying a two course dinner in the dining room with a choice between barramundi or lamb served with vegetables and sauté potatoes. 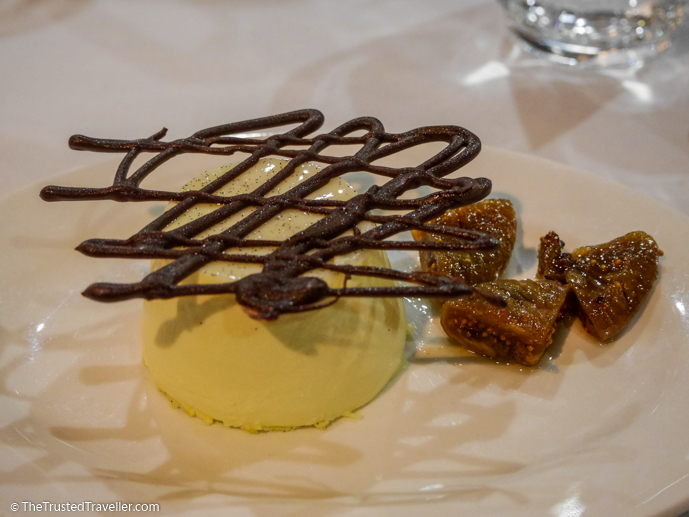 Dessert was a vanilla panna cotta with figs and chocolate. The third night was lots of fun with a BBQ onshore at Sunnydale which included lots of BBQ’ed meats, salads, billy tea and picklets with jam for dessert. 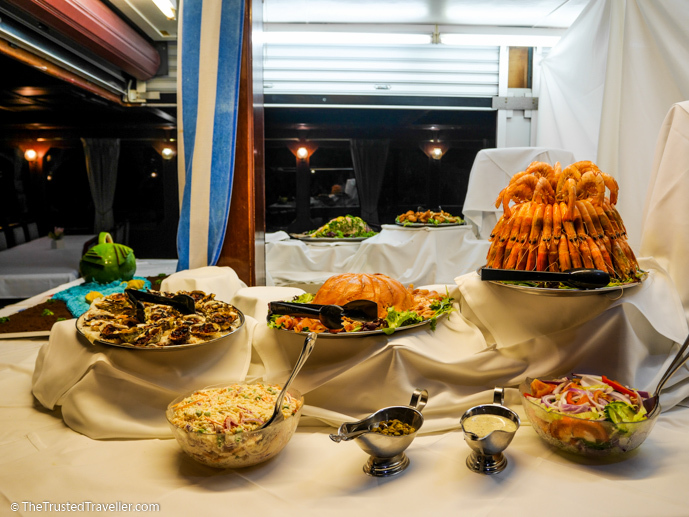 And finally on the last night we enjoyed the Captains Buffet which was full of seafood, a hot and fresh-cut ham and turkey and lots of salad accompaniments. After petit four and cheese platters were served at our table. 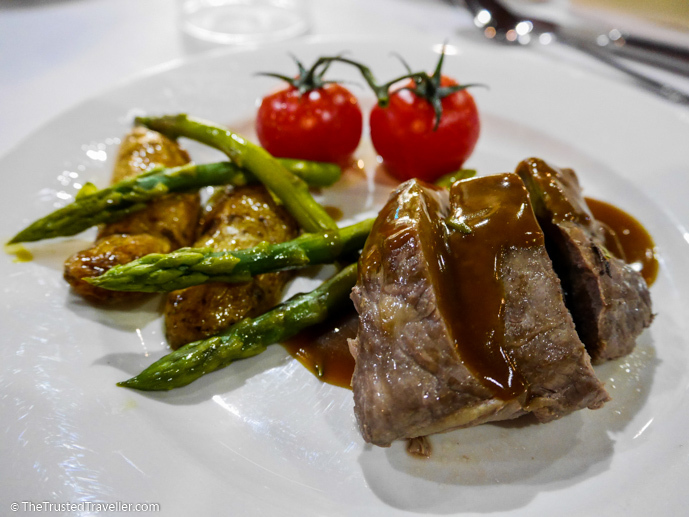 Everything we ate during the cruise was of such a high standard. We left every meal feeling satisfied and the only complaints we heard from other guests was that they were too full because they couldn’t resist eating everything on their plates! 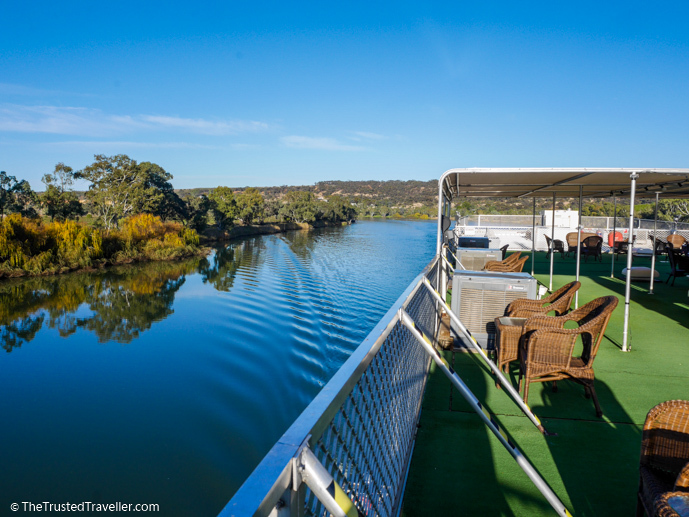 One of the great things about cruising the Murray River on the PS Murray Princess is that the pace is slow which gives you time to relax but also allows you to take in every inch of the spectacular scenery along the river. Like the food, each day on-board is different. One day you might spend most of the day cruising, the next could be packed with shore excursions, or another day could be a bit of both. Everything is optional, so if you don’t feel like heading onshore to explore, you’re welcome to stay on-board. And for those times when the boat is cruising, you have the option to just sit and enjoy the view, or join in on one of the organised activities to break up the day a bit. 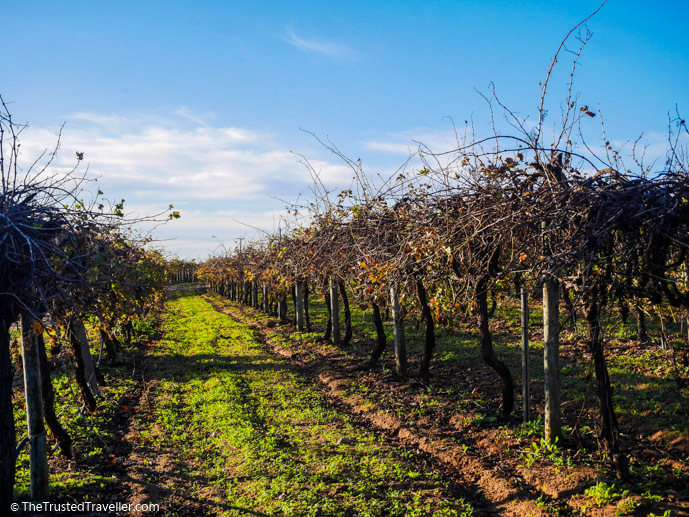 Visiting Burk Salter Winery – while the wines weren’t exactly to our taste, we loved meeting the passionate wine makers and hearing about how they produce their wine. 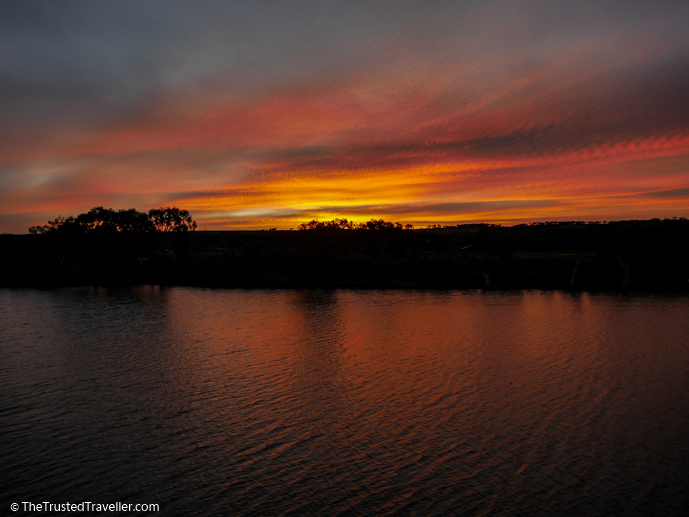 Sunrise and sunset – this is the most magical time of day on the Murray River, especially if the weather is fine. Despite it being cold, we made the most of these moment on the outside deck. 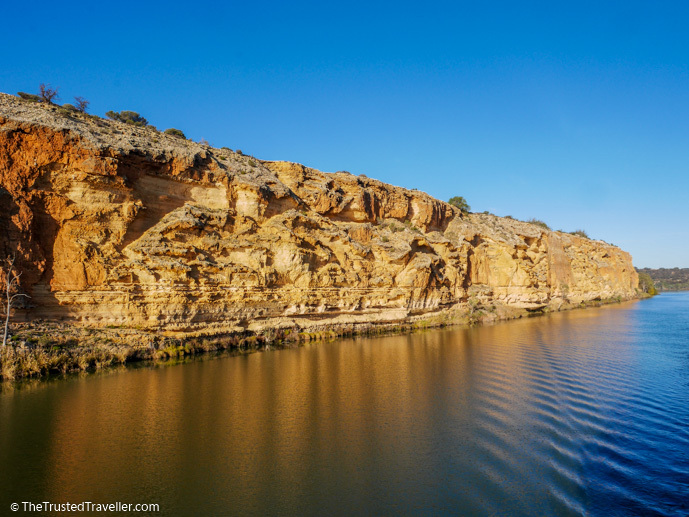 The massive cliffs – something we didn’t realise was that parts of the Murray River are lined with giant cliffs that tower well above the vessel. We just loved sitting up on the top deck in the sun watching them slip by and seeing the range of birds that nest in them. 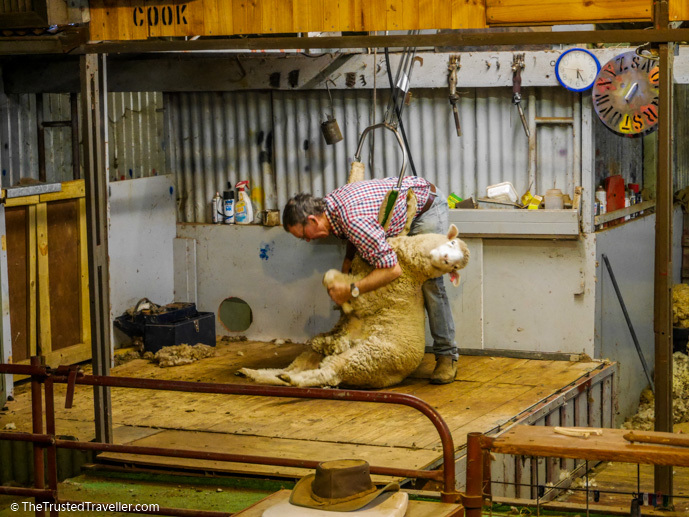 A Woolshed Tour – our shore excursion to a working sheep farm included lots of interesting information on sheep and shearing as well as a bit of fun participating in a sheep auction and race. 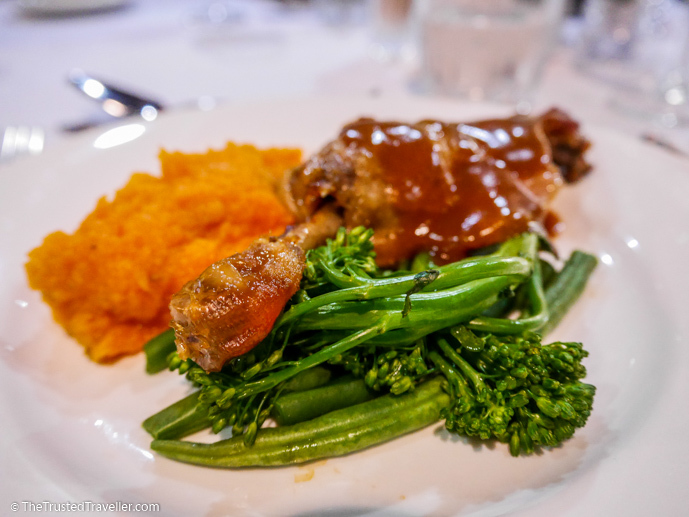 BBQ Dinner – not only was the food great at the included onshore dinner but the atmosphere around the campfire, games and entertainment made this the highlight of the trip for us. 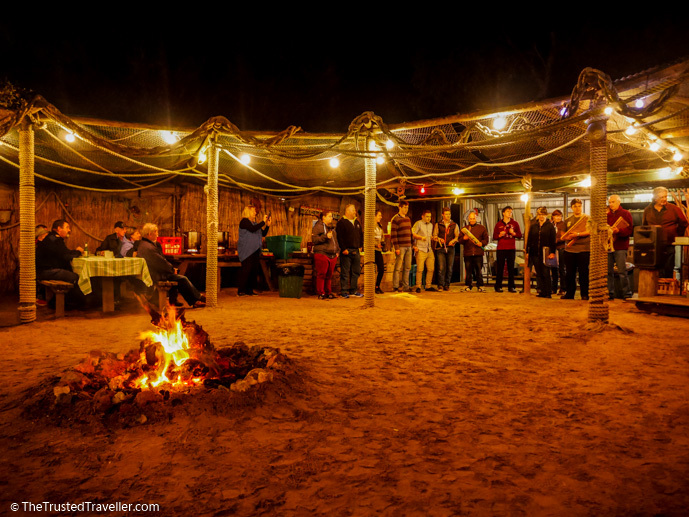 It really gave everyone a chance to mingle, have fun and be entertained in a relaxed setting. 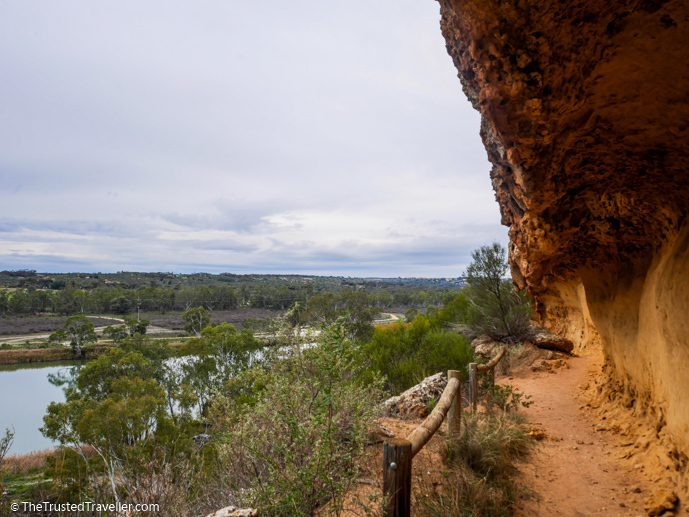 Ngaut Ngaut Aboriginal Conservation Park tour – an informative and interesting tour where you get to hear stories from the local Aboriginal tribe and see carvings that are thousands of years old. We took the full tour to the top of the cliffs, which rewarded us with spectacular views of the Murray River and its surrounding landscape. Pelicans – the Murray River is full of pelicans and you’ll see them everywhere both during the day and at night. They are such elegant creatures. Daily on-board entertainment – the crew put on lots of fun on-board activities for guests that choose to join in. We played trivia, bingo and even placed bets at Murray River Cup. 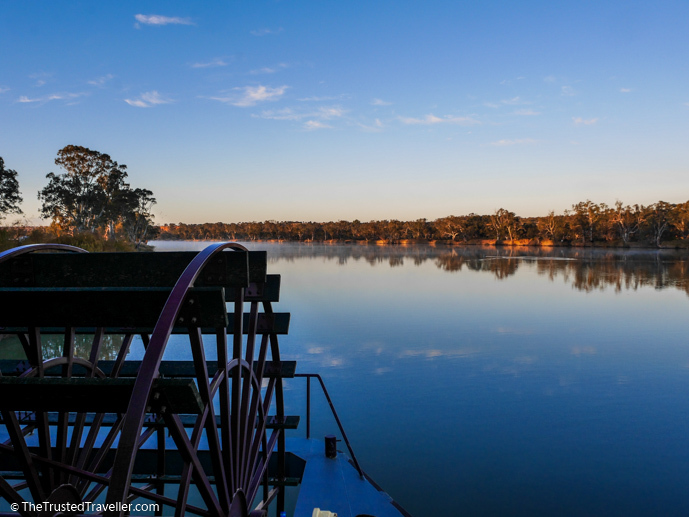 Captain Cook Cruises offer cruises on the Murray River aboard the PS Murray Princess all year round. Standard cruises range from three to seven days with longer special event cruises available at certain times of the year. 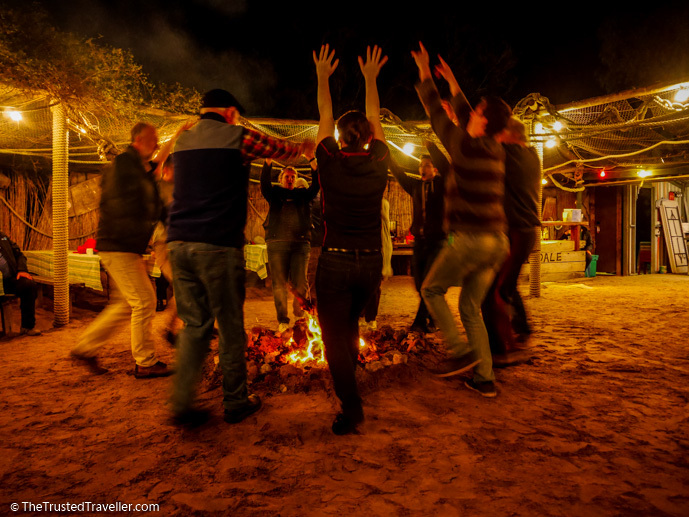 Packages that include other South Australia highlights can be arranged as well. Cruise prices start from $787.00 AUD per person and include all meals, on-board entertainment and most shore excursions. 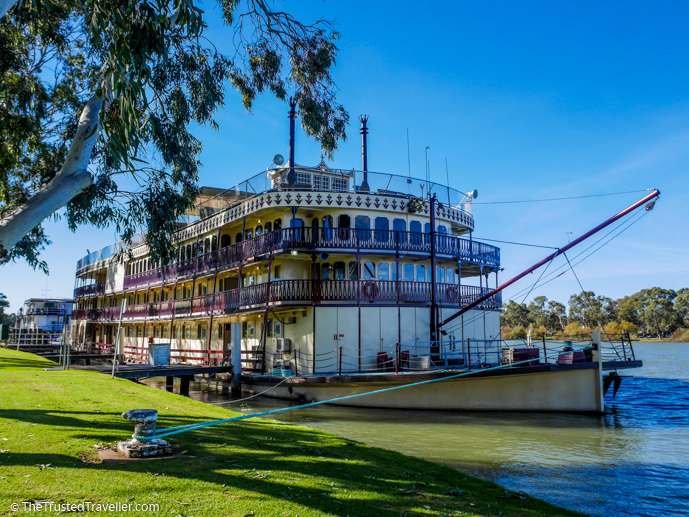 Cruises depart from Mannum which is about one and a quarter hours drive east of Adelaide. There is parking available in Mannum or Captain Cook Cruises can arrange for coach transfers from/to Adelaide, both are free of charge. 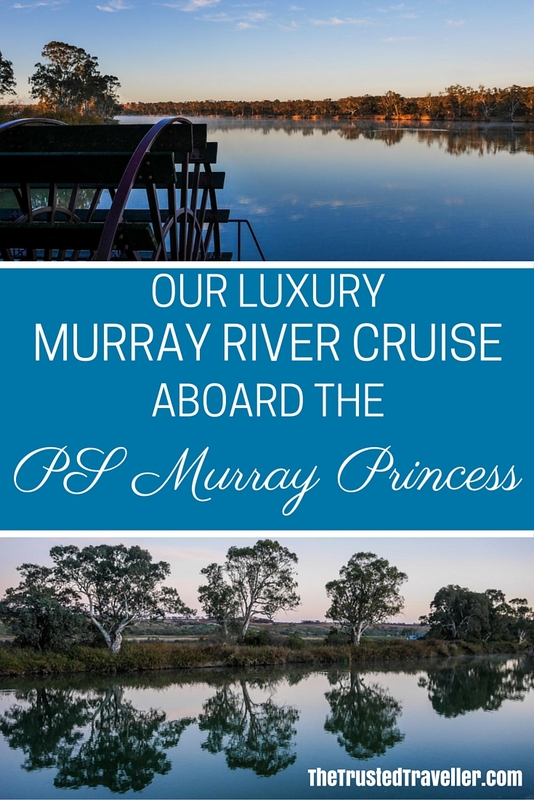 If you’d like to enjoy a Murray River Cruise on the PS Murray Princess just like we did, then check out the Captain Cook Cruises website for full details and to book. 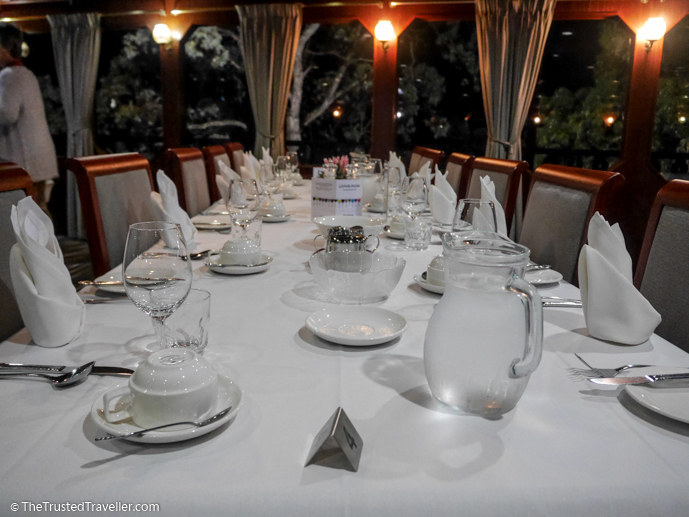 We would like to thank Captain Cook Cruises for hosting us on-board the PS Murray Princess. As always, all opinions expressed in this review are our own and were not influenced in any way by receiving a complimentary cruise. 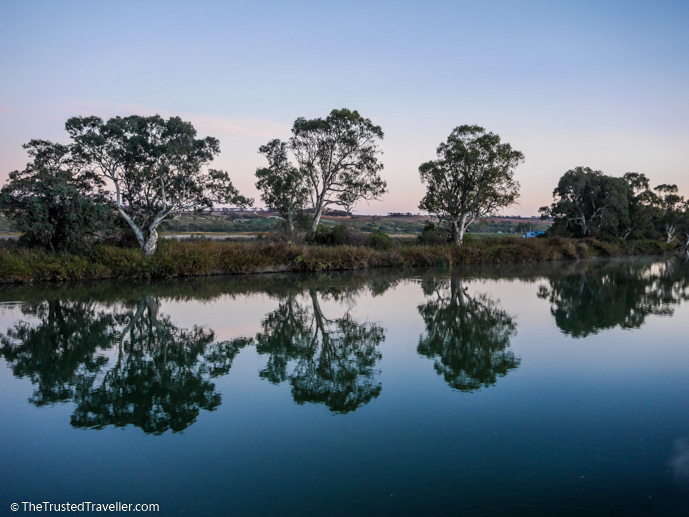 Is a Murray River Cruise something you’d like to do someday? 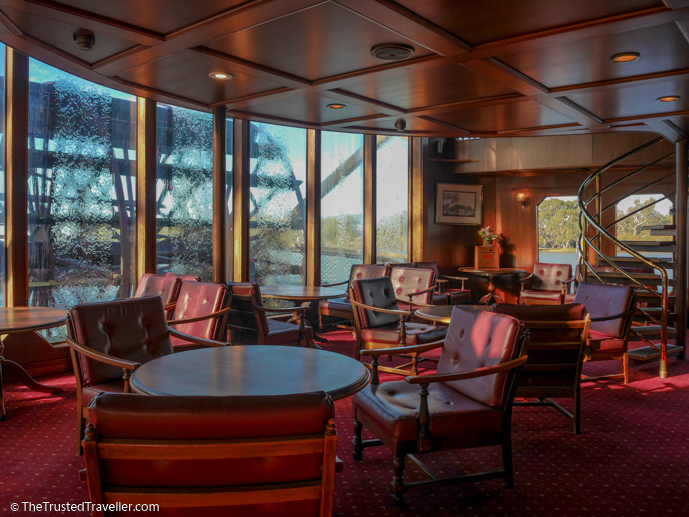 Have you tried river cruising before? Some longer cruises allow you the opportunity to get off the boat and experience Aboriginal culture, shearing exhibitions and other tours to learn, engage and explore the local region. That’s exactly what we did Wilton!